The day started with a walk to the viewpoint for the Jakobshavn Isbrae ice fjord – approximately 15km of the largest icebergs I have ever seen, grounded against a terminal moraine complex. Frustratingly the weather closed in and it started snowing with a vengeance. Whilst it looked lovely, the snow storm and accompanying gloom masked the iceberg calving events that were tantalisingly audible through the murk! It is now 5.30pm local time – 8.30 with you, and we are transiting to our next survey point. I aim to run a 25km line across the outlet to another glacier located in the north of Disko Bay. I am hoping that it will not only help delineate previous drainage channels, but will also show the beginnings of the volcanic stratification in Suvdlorssuaq – a strait that runs north of Disko Island. 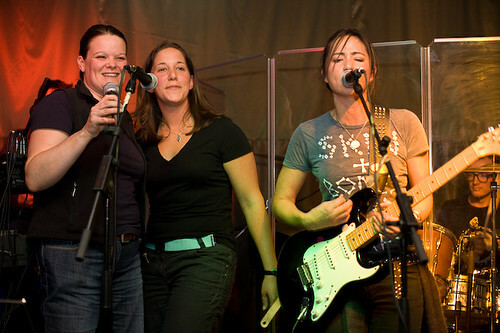 ‘The Icebergs’ Carol Cotterill and Emily Venables with KT Tunstall. I am going to have to cut this update a little short today as we have a correspondent from The Times calling us at 6pm to talk about the science and arts being accomplished on the trip. However, excuse my inserting something non-scientific at this point, but a highlight of the trip for me happened last night when myself and Emily were called up on stage by KT Tunstall to sing backing vocals on one of her tracks at an impromptu gig in Ilulissat!